A group of Freedivers known as Apneists UK. Our membership makes up the large proportion of Freedivers in the North of the UK and Wales.We have sessions in Manchester, Stockport, Liverpool, Sheffield, Yorkshire and Bangor. We are growing steadily each year finding more freedivers to enjoy the sport with us. We are passionate about the sport and have been doing it for over a decade, we are in the sport because we love it, that is very important when looking for a group. We run the UK Nationals, have UK squad members as part of the group, we have recreational trips and basically Freedive whenever we can. The group started with a couple of Freedivers, one of whom was the former UK Freediving champion John Moorcroft who is now still a lead member of the group and helps teach new freedivers. 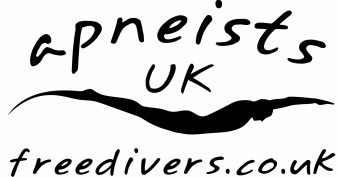 The group steadily grew based around our main training site which is Dorothea quarry in North Wales where we have permanent lines set up specifically for Freediving. The club is a loose group of people from all walks of life, some are recreational some are competitive some are professional teachers of the sport. All have the same goal: To help each and every person in the group to train safey and help the freediver next to them to reach their goals. We run professional AIDA Freediving courses for those in good health and over 18 years of age. Our classrooms and pool for the courses we run are based in Manchester bookings can be made though our learn2freedive.com site and our Internationally Qualified Instructors will travel the length and breadth of the country for groups if sufficient interest is there. We have our club meet every Monday from 7.00pm - 9.00pm. We also have pool sessions in Liverpool (Fridays 8.30pm) and Stockport (Sundays 8.00pm) with other informal sessions too. After qualifying we have a very active group and do lots of diving, no armchair Apneists allowed. We train depth at Capernwray in the lakes and Vivian in Llanberis and Dosthill in Tamworth. Our true home though is Dorothea quarry in North Wales, nowhere else is deep enough.